Now that I am back in Maryland and have more crafting time, I signed up for the Card Chain Challenge at Society of Stampaholics. 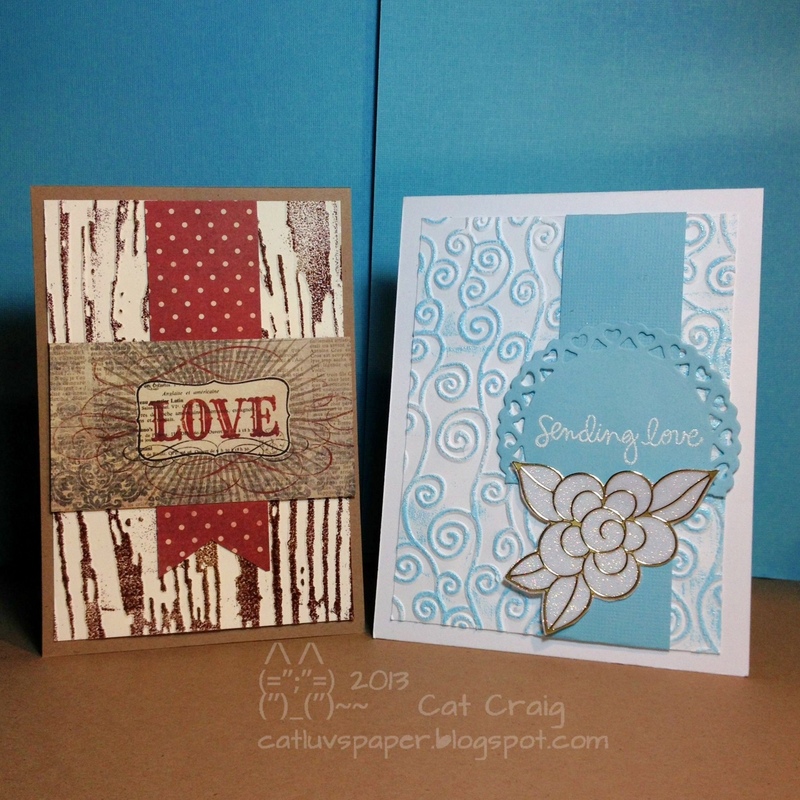 You make a card, send it out and get one from another crafter. It is fun to see in person the crafted cards. 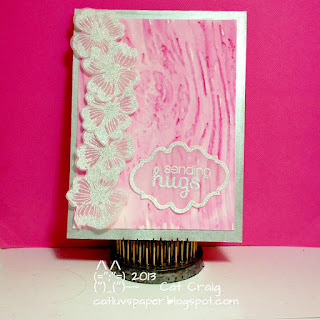 I made this mid May while I was in my Stampin Up Stash phase. Participants are given several options for the card. I decided to go loosely with the sketch which features some layers, a top sentiment, and 3 interest point across the horizontal card front. I used Paisley Petals Papers, Versafine and Versamark inks, clear embossing powder, Pumpink Pie Ink from SU, 5th Avenue Florals stamps, and the sentiment from Bella's Bloom. 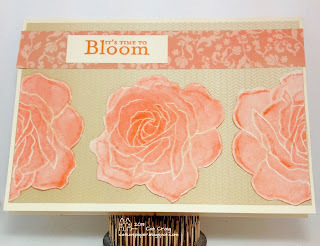 The roses were clear embossed on cream cardstock, then colored with Inktense Pencils and a water brush. My BIL is having a birthday today. I wanted to make him a card, because we don't get to see him as often as we would like. He was the Best Man at our wedding, and he is truly a good guy. My in-laws raised some wonderful children. I am so blessed to be part of this family. 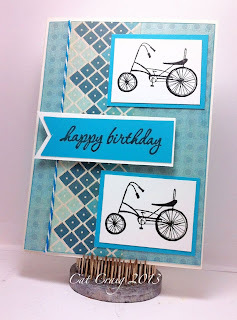 I used a Darice clouds embossing folder on light blue paper, then dabbed over the clouds with Unicorn pigment ink. 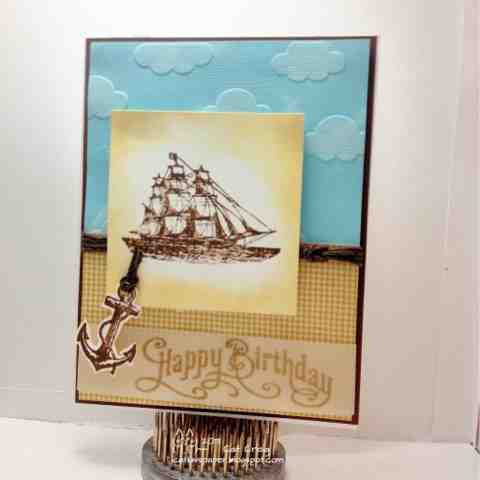 The ship and anchor are from Stampin Up's The Open Sea set. 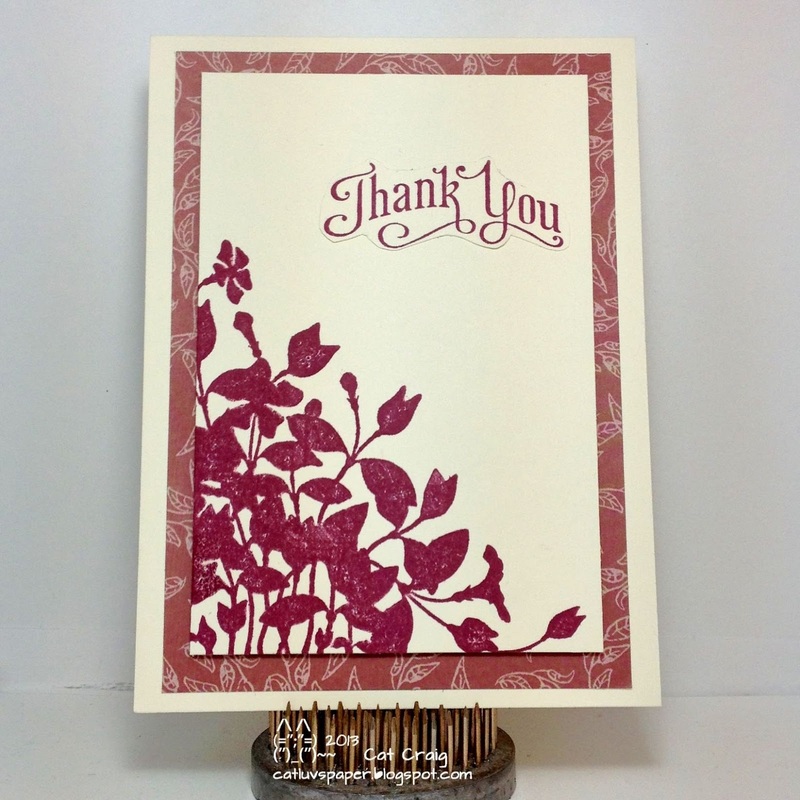 The sentiment is from perfectly penned from Stampin Up. I really like the sentiment embossed on vellum. The cording is true hemp from Hemptique. The patterned paper is fom MME. 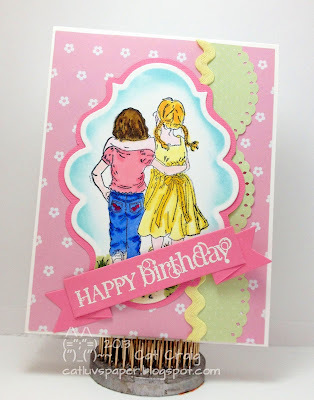 I love girly cards, I love layers, and lace and ribbon, and everything piled up. I have such a hard time making that card though. This time I think I achieved exactly what I wanted. I am happy to say I am getting near having inked up at least a few stamps in each Stampin' Up set that I have. It has been fun creating these cards. 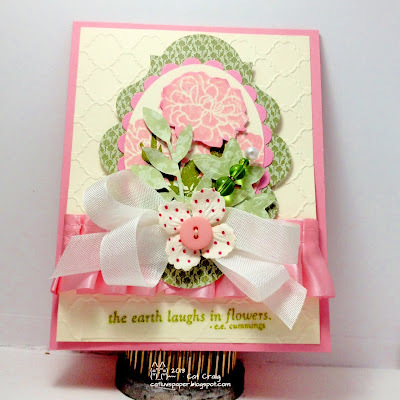 This one uses: Paisley Petals Paper, Pink Paper, Very Vanilla Paper, Think Pink Ink, Old Olive Ink, Fabulous Florets Stamp Set, Sweet stem and Little Leaves Sizzlets. In addition, I used 3 Spellbinder dies, a Lifestyle Crafts embossing folder, some pleated ribbon from my stash, a Prima paper flower, a Doodlebug button, Hug Snug seam binding, some string from my stash, a pin from my stash, some foam dots and squares and lettuce green embossing powder from Stampendous and versamark ink, and a scrap of vellum. This one screams springtime and parasols to me for some reason! I am entering it into the Simon Says Stamp Flower Power challenge. Thanks for stopping by have a great week. Quickcard60s, a photo by Cat Craig on Flickr. Another of my favorite Hero Arts 90 minute scrambles again Saturday afternoon. This was quite a challenge. Use music, heavenly bodies, no green, and an ink color other than black or brown. I created the star background with white ink and silver glittered white embossing powder. I searched my stash for 20 minutes to find some music paper, whew...i have no musical stamps. Twine and some vellum stars with the sentiment and it is done. The music strip is actually on the inside of the card. I so love my crafting space here in Maryland. I overlook the backyard; and hubs has kindly placed the bird feeders and bird bath in the perfect spots for my window's view. Often I see Blue Jays, Morning Doves, Cardinals, Red Bellied Woodpeckers, Red-winged Blackbirds, Squirrels and the neighborhood cats lazing watchfully under the trees. That view is the inspiration for this card. 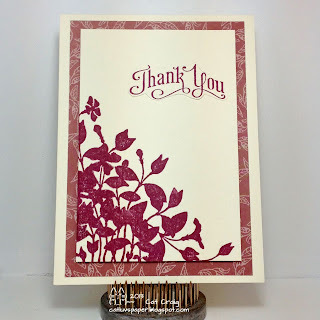 I am still playing in my Stampin' Up stash. This card features the stamp set Language of Friendship, and the build a bird punch. I used two spellbinder dies, and some black Hug Snug seam binding. Images were stamped with tuxedo black memento ink, colored with Spectrum Noir markers and dotted with black enamel accents. 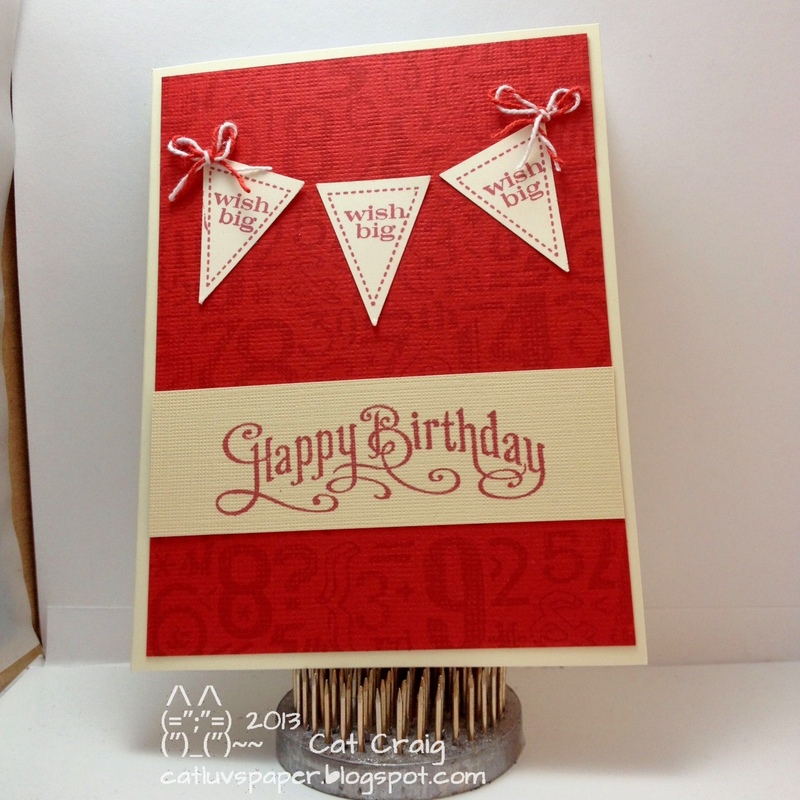 That adorable cherry paper is also from Stampin' Up-Specialty Sweet Shop set. The inking was done with Distress inks in Tumbled Glass and Peeled Paint. I liked the sketch at Mojo Monday this week and decided to try it out. I used Stampin Up supplies again. I finally inked up the new-ish Designer Typeset clear stamp set, it takes ink pretty well. Papers are all from Paisley Petals and the sentiment is from My Friend. 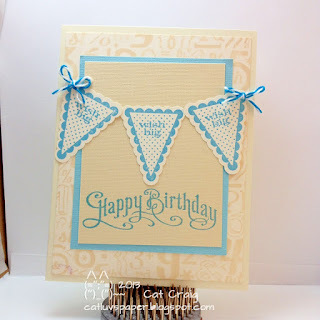 I used a Sizzix round die, and fussy cut the banners after they were stamped. The stitching is with a sharpie marker. Ink was Versafine Vintage Sepia. Butterflies were punched with a fiskars punch. Why is it so tough to come up with a title for a blog post? I am still playing with my Stampin Up stash. I expect I will be for several more days. Though I did take a few minutes today to check out some online shopping at EH and SSS. My wish lists are refreshed, and ready for next months craft budget. 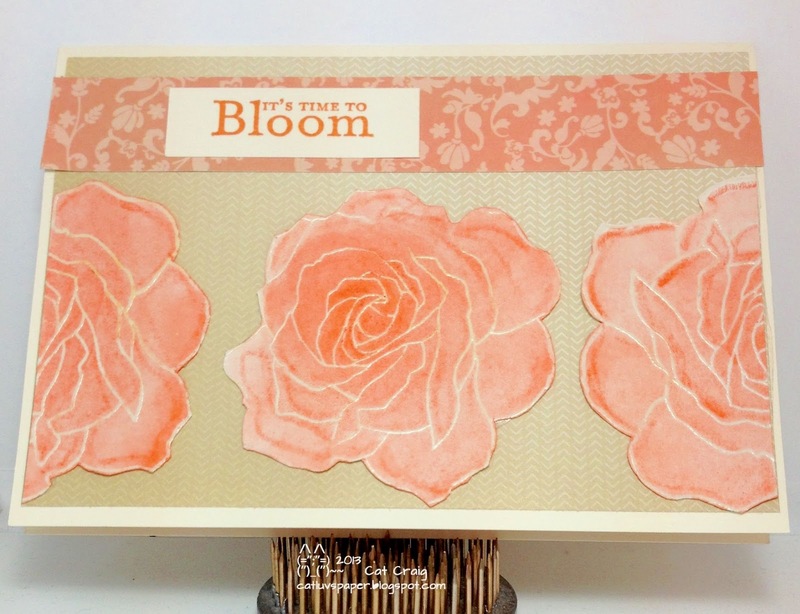 Of course the new Stampin Up book should be out soon too...oh well give me plenty of time to browse it and then hit it with the July and August budgets. My Godson, almost 17 is really a great young man, I cannot call him a kid any longer especially since he towers over my 5'4" on a good day height. He sent me a cute Mother's Day card (I have only 4 legged "kids" and my Godson). I needed to send out some thank-you cards. Since I have not done much with my Stampin Up Stash, I am making an effort to use it first before I reach for any other items. Once they have all been ink'd I'll mix it up again. I used patterned papers from the Paisley Petals collection, Marina Mist Ink, Reason to Smile Stamp set and the sentiment comes from Teeny Tiny wishes. 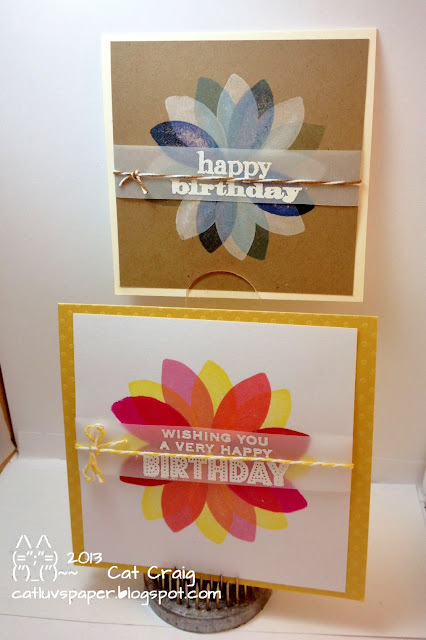 I used two Stampin Up Punches: modern label and word window. I also used a fiskars edge punch. 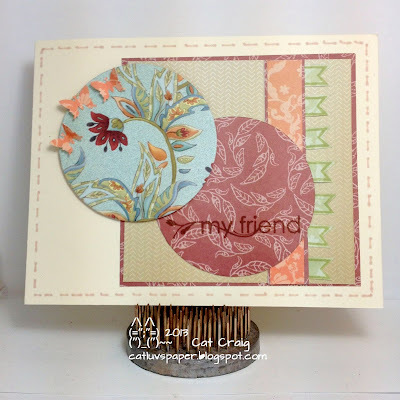 The circles were cut with Sizzix circle die. I lined the inside of the card with the same patterned paper that is the outside frame on the circle, I also used a very narrow strip of that paper just above the scalloped edge on the front side of the card. The scalloped edge to me appears to be floating on the card as a result. And, of course a bit of bling. 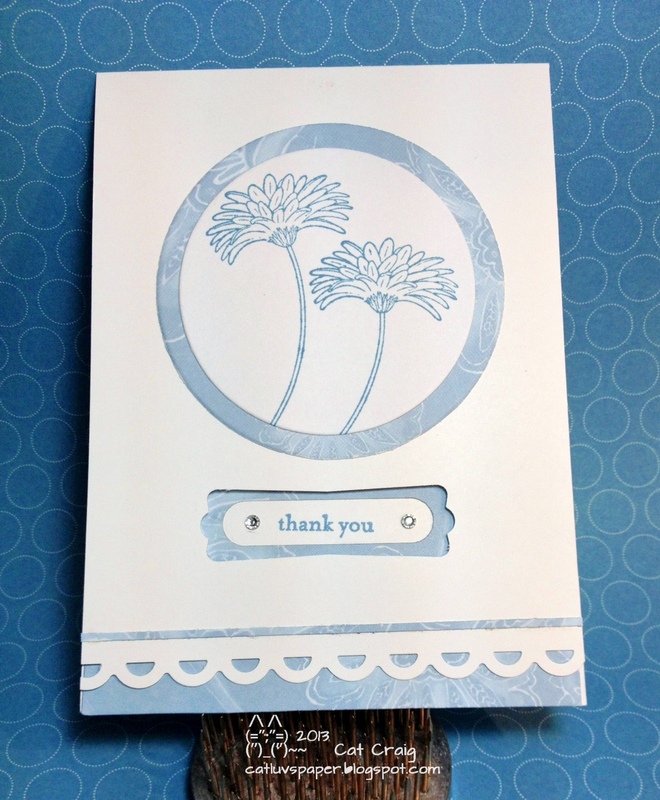 I cut the word window out of the patterned paper and stamped the sentiment in that space on the card base. I then cut out the modern label from the front of the card to frame the inside sentiment. The first one took about an hour, the remaining 4 were much quicker, once I figured out what I wanted to do. I am pleased with the results. The cards are out in the mail to their recipients. 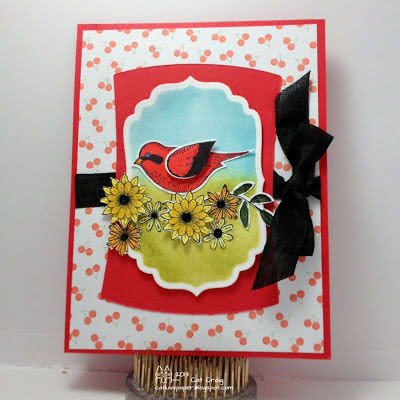 To celebrate 350 Cards & Gifts Week Moxie Fab World is having a contest. The contest is to create a paper crafted card set and container to give to someone dear. I have not played much at all with my Stampin Up stamps, and I shipped them to my east coast craft room. I finally got a chance to sit down with them and I made a set. I primarily used papers from the Paisley Petals set, some Certainly Celery ink, some Whisper White cardstock, Certainly Celery striped ribbon, some green ribbon from my stash, a bit of lacy ribbon from my stash, some Martha Stewart Doilies and tags, Lifestyle and Sizzix dies, and the box was just made free hand with my Martha Stewart score board. While green is not a favorite color of mine, I love how the cards turned out. I made this card for my MIL. She is a wonderful MIL, a sweet person and I am blessed to have a wonderful friendship with her. We clicked almost immediately. Happy Mother's Day Mom Craig! Last Saturday, there was another scramble hosted by Marcy at the Hero Arts Flickr group. Her sample cards were gorgeous! I was to go out with hubs for lunch and some errand running. I took a quick peek at the theme, and I had to play...but I played fast. Thirty minutes from start to upload I think. I made a very basic card, but somehow it was appealing to me. There were so many beautiful cards made, I wish I had had more time for the scramble. If you'd like to see them, click here. The next scramble is coming up Saturday, May 18, at 5:00 p.m. PDT (8:00 p.m. EDT). I needed to make birthday cards for our nephews, and I was completely brain dead. Finally I made a few and let hubs pick out who got what. Of course the one I liked best was deemed too girly for the pre-teen and teen boys. Which two would you have chosen ? I brought all my Stampin Up tools, stamps, inks and paper to Maryland. I have decided to concentrate on using those stamps because some have never seen ink. Granted I have only been collecting them for 9 months. 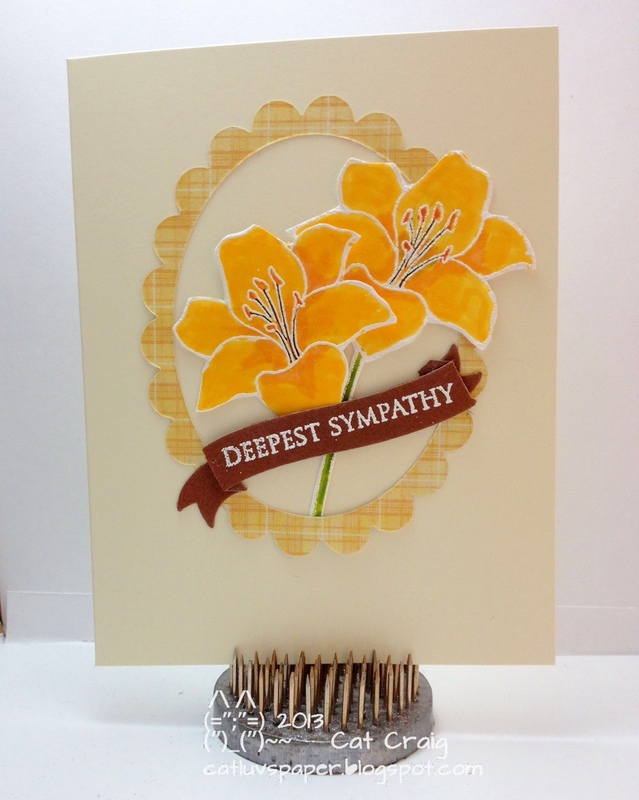 First up a sympathy card. These are so very hard to make. I'd rather make a man card...or even a teenaged BOY card. This one uses Fifth Avenue Floral. I colored it with Memento Markers. 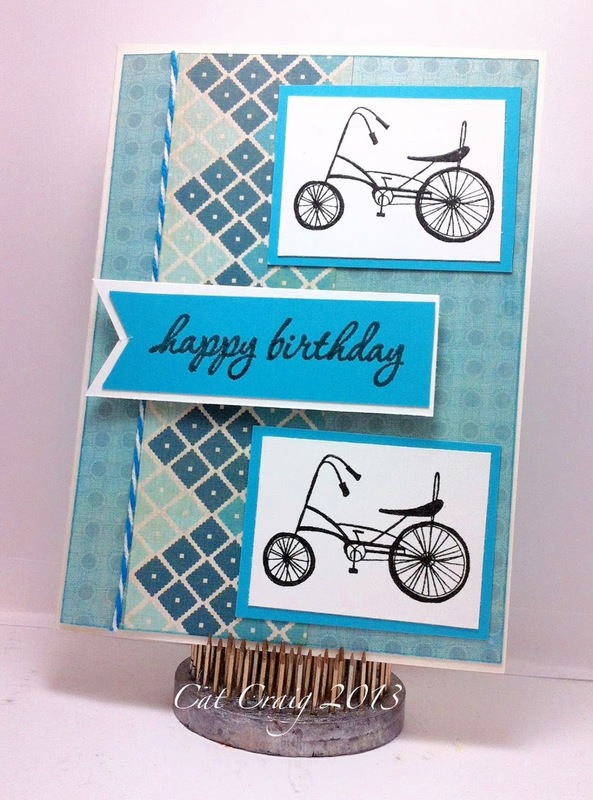 The frame is the result of two spellbinder dies. 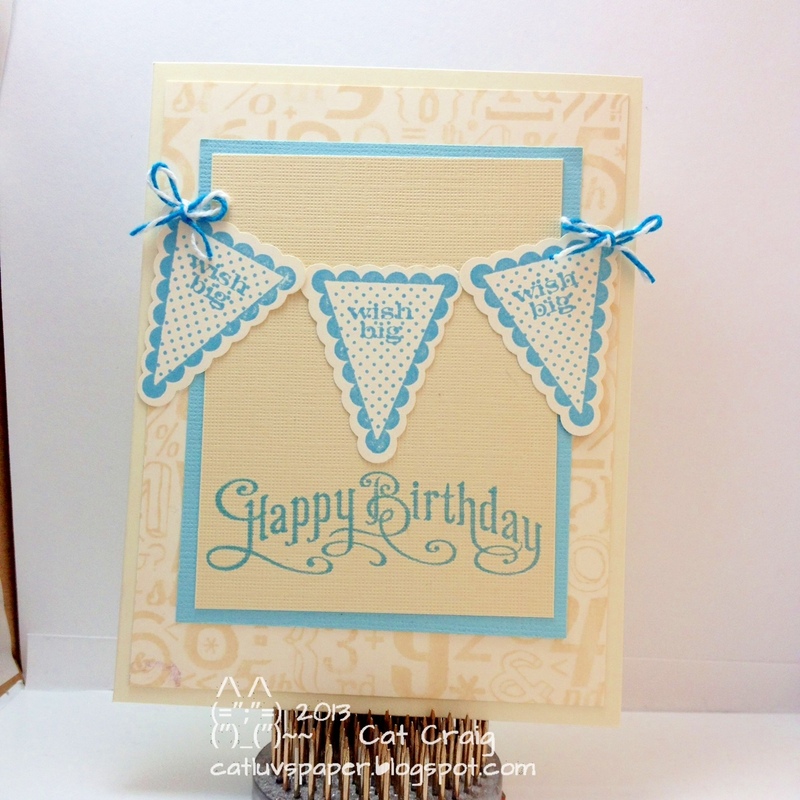 The sentiment strip comes from a Simon Says Stamp tilted banner die. The sentiment itself is Hero Arts. When I saw this picture at Moxie Fab Worlds Tuesday Trigger, I wanted to play along. 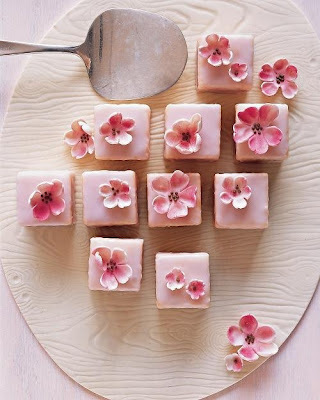 The things that struck me were the pinkish flowers, the silver serving spatula and the wood grain the desserts are sitting on. Of course I had to change it up some. I dry embossed some water color paper with a Sizzix wood grain embossing folder. Then I added fuchsia Inktense pencil with a water brush. I just wanted a wash of pink, with the wood grain still showing through. I heat embossed flowers (Hero Arts) with Winter White embossing powder (silvery white) onto vellum. They shimmer, but that is hard to capture in a photograph. I drew on Silver Zig marker paint around the edges of the card base. The edges of the die were patted into versamark prior to cutting the shape. I then stamped the sentiment with the die still on the vellum. 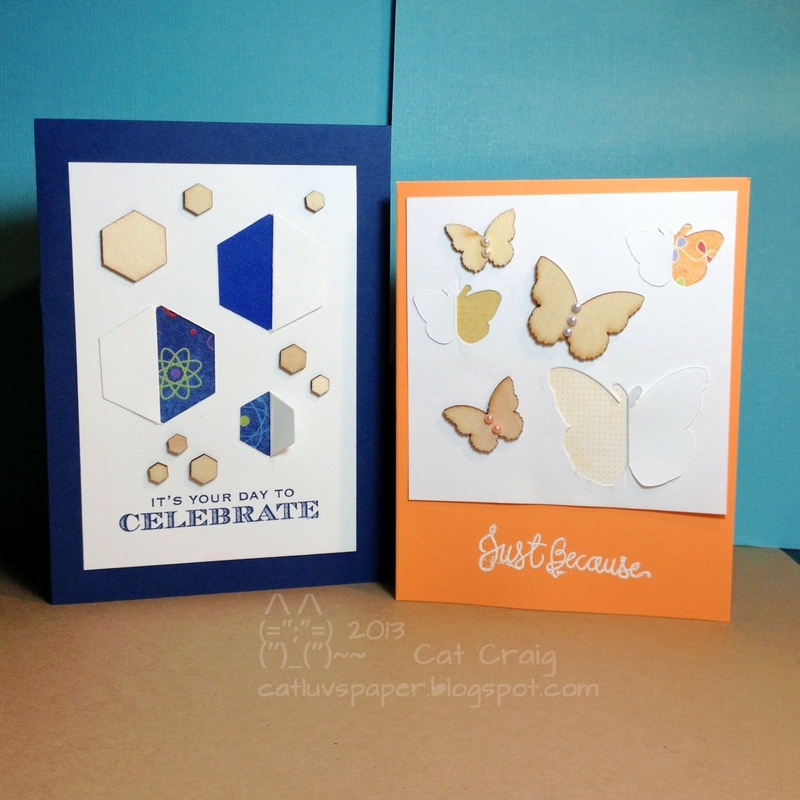 I pried them apart carefully and added the embossing powder then melted it with the heat tool. The flowers were adhered to the wood grain panel with foam dots. The sentiment is adhered flat. I got side tracked this week and did not get to my homework until late Sunday evening. I wanted to finish my last 4 cards before midnight and get them posted...then I get to start the week fresh. Day 5 was Love Cards/Anniversary Cards. I enjoy watching the video on double embossing - dry embossing a panel, then covering the raised portions with versamark watermark ink and embossing powder, and lastly heat setting the powder. This is much much much harder than it looks in the video. I am happy with both cards, both have a bit of "smear", but I like what resulted. 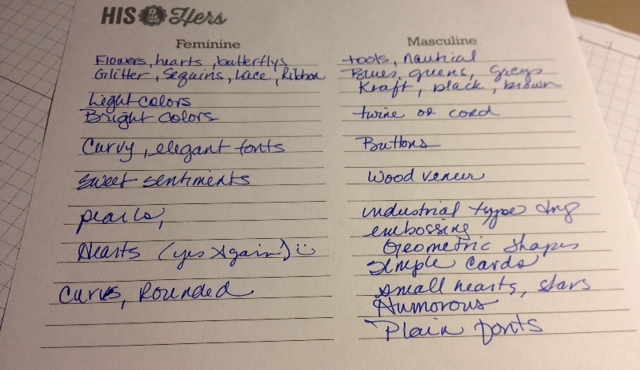 Lastly we were given on day one a sheet for figuring what his and hers meant to each of us. Below is my list. Upon my return to Maryland, there was a modest stack of crafting magazines waiting for me. Hubs is very good about placing them right on my desk in a neat pile when I am out of state. One of the mags I get is the British Cardmaking and Papercraft. It is a bit pricey, but there is always a goody or two included. The current issue included a stamp set and some patterned papers. The freebie stamp set called Apple of my Eye Collection by Jayne Nestorenko had the cutest stamp of two girls walking along; a perfect image for my matron of honor and best girlfriend of close to 40 years now. She is having her birthday today. I wanted to make her a special birthday card. We were able to see one another just once while I was in California, but we had several telephone conversations as well. Thank goodness for telephones, it makes leaving my gal pals behind not quite so sad. I stamped the image with Memento Tuxedo Black ink, colored it with a whole slew of Spectrum Noir markers. I cut it out with a Spellbinders die, added some inking around most of the inner area, and then matted it with a hand cut tracing of the same spellbinder die. This gave a thin border mat. 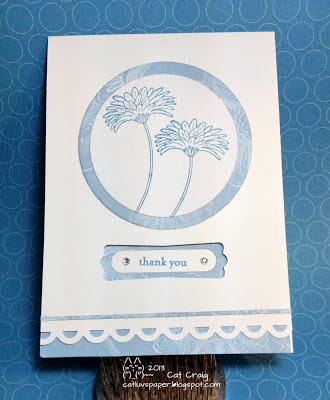 I used a Simon Says stamp banner die, and the oh so adorable white heat embossed sentiment from Stampin Up’s Curly Cute set. The patterned papers are Emma’s Garden by Jennifer Ellory, the scalloped edge produced by an EK Success punch, and a bit of left over yellow rick rack ribbon added some more color. I loved the nostalgic feel of the card, after all we were girls together and grew into women together over the years. Today, my homework was done well before the sun even set. Sympathy cards...I am on the fence about them. Wait until it is needed...or have a few ahead of time. One is a card made not in the best of creative spirit, the other just seems wrong somehow. A true conundrum. This time I followed Kristina's lead. 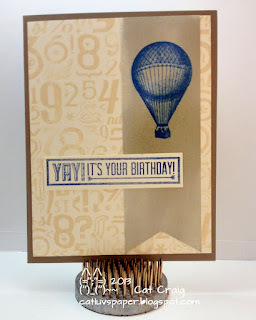 I used the same ink colors (Hero Arts Soft Pool and Soft Sand), same card base (Stampin Up Very Vanilla), and three stamp sets. 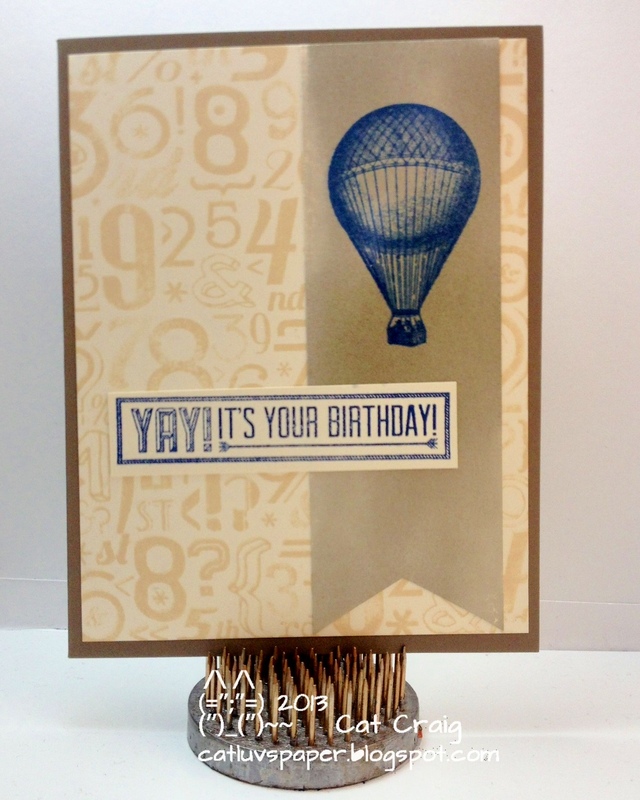 The border stamps came from a Recollections set, the sentiments came from Hero Arts and Simon Says Stamp. Care to guess which is the His version and which is the Her's? Day 2 of His and Hers was so full of GREAT cards. I am once again up late working on my homework. I am happy to say I finished it a couple of minutes before midnight. The colored vellum technique looked so cool, but after a few tries it was such a no go for me. So I decided to go with Jennifer's Kaleidoscope style card. I personalized it a bit. My first challenge was finding a leaf stamp that was solid. None of my stash has a solid leaf. Then I found a clear stamp set (Hero Arts CL374) and used the back side for a solid surface. I really like the masculine card that Jennifer showed us which was white stamped on Kraft with greens and browns, and decided to use that design for both the cards. I changed only the ink colors, sentiment styles, and I added some twine. My "His" card used Colorbox Frost White for the base pattern on Kraft. I then stamped the leaf again in shades of blue ink all from Hero Arts: Soft Pool, Cornflower, Stonewash, and Navy. The sentiment is from the same Hero Arts set CL611 also heat embossed white on vellum. I couldn't resist the twine and added brown and white tied in a knot along the sentiment strip. This was mounted on a very vanilla card base. Card size is 4.25 by 4.25. I am so loving this class!